Your donation of $100 will help fund the cost of seed, fresh nesting material, natural habitat maintenance, and so much more for the beautiful wild birds that make Chapman Sanctuary and Visny Woods their home. 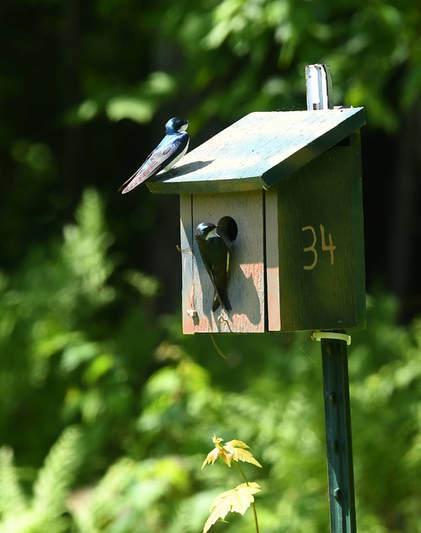 Located along CSVW's scenic trails in Center Sandwich, New Hampshire, each adopted birdhouse is ​well-maintained and will display a donor recognition tag for all of 2019. MAKE IT A UNIQUE GIFT! Give this meaningful, charitable gift to the bird/nature/wildlife lover in your life! CSVW will send an acknowledgement of your generous gift, inform your recipient of their sponsored birdhouse number and apply a recognition tag for 2019. ​More information at check-out or on the Mail-in Form. We are happy to share some of the good things the Birdhouse Sponsorship program has helped to make possible for the wild birds at Chapman Sanctuary and Visny Woods in 2018.